← Theodore Roosevelt National Park, North Dakota. We were heading down U.S. 212 to I-90 in Montana on our way to Sheridan. I am sure readers of this blog tire from repeated statements that we avoid Interstate highways because they are boring. But we take them occasionally. 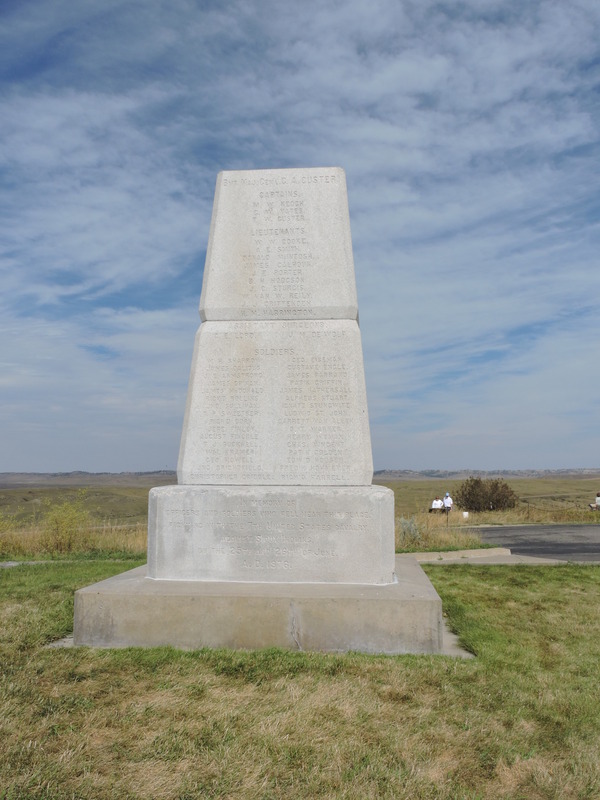 However, it was on 212 that we spotted a sign for the Little Bighorn Battlefield National Monument, the famous site of “Custer’s Last Stand” where perhaps some 2000 Sioux and Cheyenne warriors killed General Custer, his soldiers and the Crow and Arikara scouts with them June 25-26, 1876. We went in because we are interested in history, but we were a little skeptical. There is no doubt that for generations the history of the First Americans has been neglected or even deliberately been distorted. On our travels, however, we became irritated by park service signs and videos telling us how bad our ancestors were for stealing the poor Indian’s land. We believe invasions have occurred, cultures have clashed and people have lost their homelands throughout the millennia and across the world. The First Americans frequently fought among themselves and invaded other tribes’ territories for hundreds of years. They continued these wars among themselves even after Europeans arrived. That does not excuse the behavior of our ancestors, but it puts it in perspective. It was with this somewhat negative attitude that we went in to see the introductory video and museum before going out to walk the battlefield. Perhaps a great benefit of low expectations is that you are often pleasantly surprised. The video, the literature and signs were all very well done. Not only were events leading up to the battle and the battle itself well explained, all parties were treated with respect for their cultures. 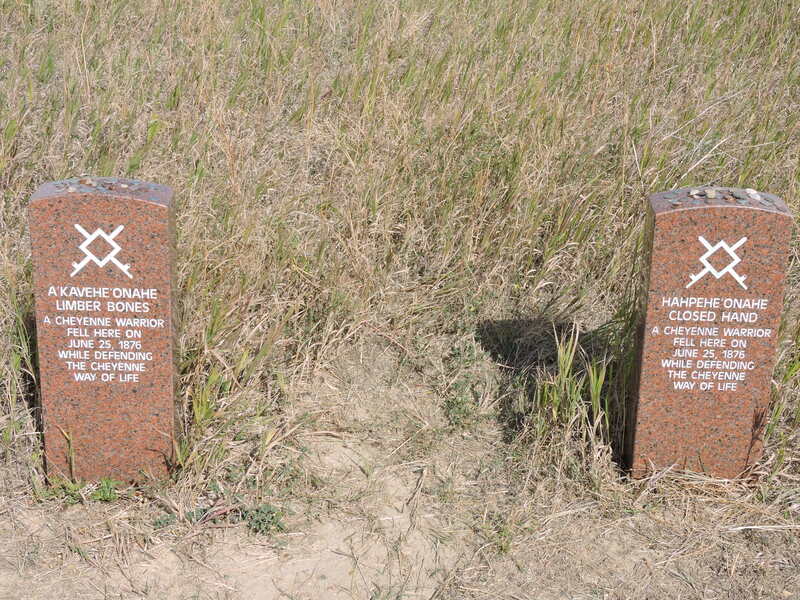 After the battle, Cheyenne and Sioux removed their dead. The U.S. forces were buried in a mass grave. The first memorial was created by the Army in 1881. 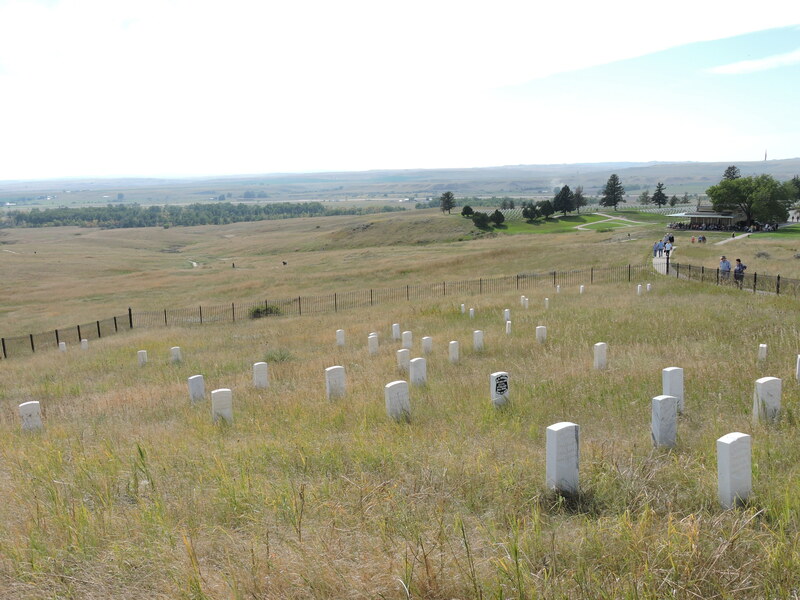 In 1890, the Army erected 249 headstones across the battlefield where Custer’s men were thought to have fallen. In 1991, over a hundred years after that first memorial, the National Park Service began erecting headstones where known Lakota Sioux and Cheyenne warriors died. Subsequent oral history and paintings on animal hides told the story from the First American point of view. The most recent “Indian Memorial” was interesting from both an historical and artistic point of view. It included wall sections honoring not only the Sioux and Cheyenne warriors, but also the Crow and Arikara scouts. Noting that this post may be controversial to some, I have categorized it as Commentary as well as Travel. 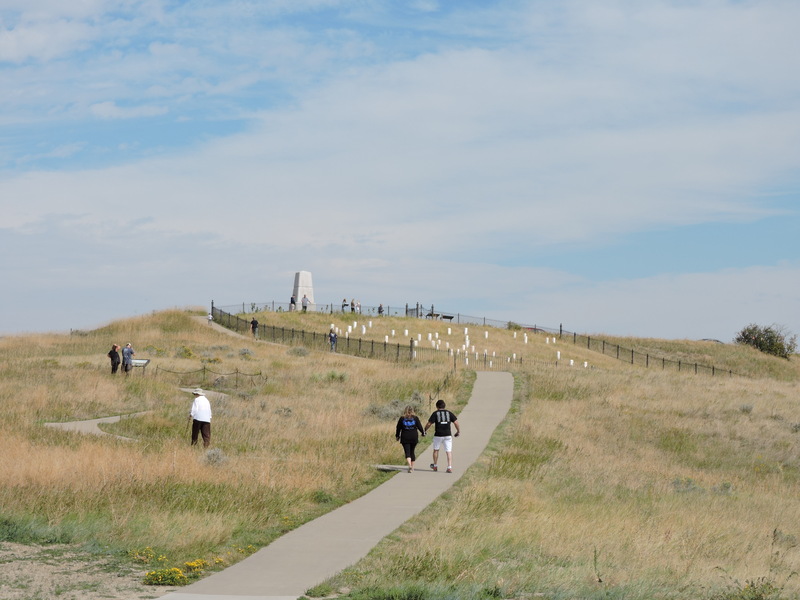 This entry was posted in Commentary, Travel Logs and tagged Cheyenne, Custer's Last Stand, First Americans, Lakota Sioux, Little Bighorn Battlefield National Monument, Montana, Sioux, Travel. Bookmark the permalink. Thanks. More than ever, it seems that everything that happens has an explanation that is simple, straightforward, easy — and wrong. History is usually written by the winner of wars, so it’s nice that other perspectives are finally being honored. But I don’t know that it would take long for a site to be considered sacred. For example, I suspect there are already folks who would consider the memorial at World Trade Center sacred ground. That is an interesting point. I also imagine warring tribes sometimes adopted the customs of tribes whose lands they took. Next week’s post is about the Medicine Wheel which is used by many tribes. Thanks Ray. My thoughts as well. As an outsider to the history of the Americas, I can understand how difficult the subject remains. I like the way that you state your case. Bill and I went through in about 1990 which was interesting to see. You get History in school but so different to actually see where history took place. Thanks again for another lesson. Love to you both. Interesting perspective. There is a saying “your view of the world depends on which hill you stand”.